Turkey's economy, like Albania's (see blogs passim), seems to be mainly based on the car. While the government tries to boost economic growth through its road building programme the private sector builds garages in order to sell the most expensive petrol so far. Ford meanwhile seem to be selling the entire output from Swaythling (Home of the Transit) here. Turkey is white van heaven. So our "Snowy" fits right in. Today started with a ferry across the lake formed by the Atatürk hydroelectric scheme. 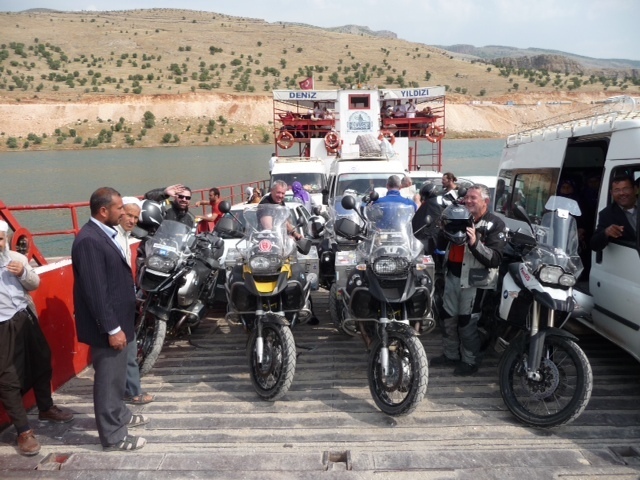 The boats were packed with wedding parties (in white Transit minibuses), goods (white Transit vans) and 13 motorbikes. No one has spent any money on the ferries or the docks since Noah came this way. Not surprising really as a new bridge will soon consign this bit of local colour to history. What to say about the rest of the day? The best ride since northern Croatia. Fast, sweeping bends with a bit of mild off-road and some hail to keep things interesting. Tonight we stay in Erzerum, Turkey's top ski resort. Who knew?